With advice from Daymond John, Bobbi Brown, Marc Cuban, Sallie Krawcheck, Max Levchin, Alexa von Tobel, and other successful early stage startup investors, Inc. magazine shows you how to attract and wisely apply your firm's first precious sources of cash. Bootstrapping, crowdfunding, VCs, payroll, profits-money makes your business boom. But mess up your finances, and the venture can go bust. It's time to get smart. Let the experts at Inc. guide you through every critical step and potential pitfall. Their on-the-ground reporting shows how to locate funding, manage your money, and smart hack your way to a comfortable retirement. Cash flow problems are the number-one business killer. Whether you're dreaming up a startup idea or knee deep in the craziness, learn to shore up your finances and safeguard the business. 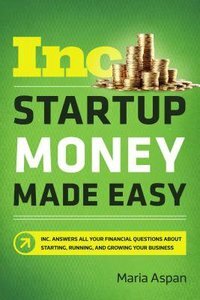 About "Startup Money Made Easy"